Red red red red red... I love red lippies. 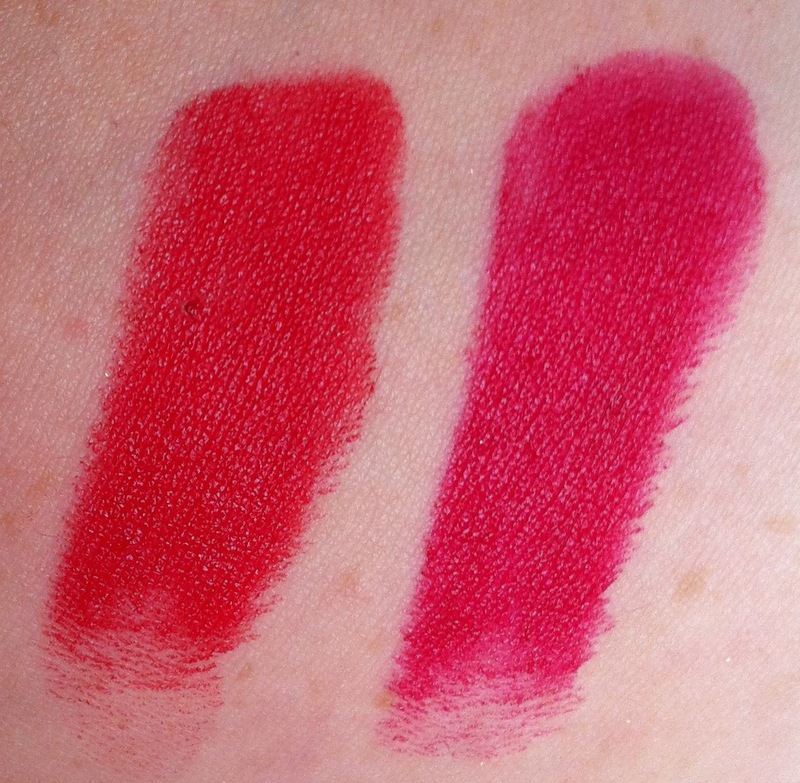 Diorling is a blue-based slightly darkened cherry toned red. It's too similar to MAC Runaway Red (from the Shop MAC Cook MAC collection), and as I already have this, it was a pass for me. Diva is a very warmed-orange-based red. I must admit, I do like this but I think I preferred it in the lighting in the store. 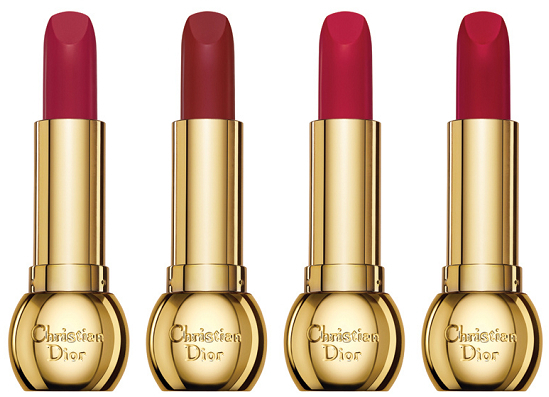 I will wear it, for sure, but probably more in the summer-time, when I tend to go for more orange-and-gold-based shades. Lady is essentially (for me anyhow) a lighter version of Diva - it's maybe not quite as warm orange-, more of a slightly cooler coral- undertone, but I really just thought that it was a poor cousin of Diva. As I'd purchased Diva, I wasn't too particularly interested in this one, personally. Marilyn is a gorgeous gorgeous pink- (almost-but-not-quite fuchsia-) blue-based red. This one I bought first and I love it. I've worn it to death and back all of Christmas (on the other hand, I'm quite obsessed with pink-based reds at present). Love love love this one. 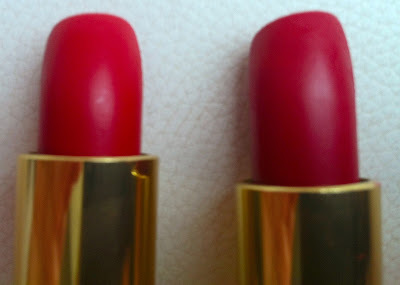 These lipsticks are almost duo-chrome, in that I've found they can appear either red or their undertone shade (eg pink in the case of Marilyn, orange, in the case of Diva), depending on the light, what else you're wearing on your face and in terms of your clothing. Unusual enough that. 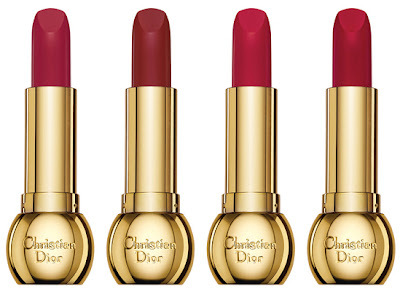 The formula for these lipsticks is be-yond-amazingly-be-oo-ti-ful. They glide, they slide. No pulling or tugging here. They are slightly-more-sheeny-than-satin finish, but not glossy. They don't fade or go patchy, they don't dry out your lips, they don't come off (too much) on your glass. They last and last and last for hours. They are also not cheap, at *cough mumble* €32.50. That's each. But I do love 'em. Note that these are the European/American colours. The Asian colours are same names/numbers but different shades. Targets? Challenges? New Years R-word?